If you generate offensive waste, you have to abide by disposal regulations. Use Direct365’s services to avoid substantial fines. We’ve dealt with offensive waste disposal for years, meaning we know what you need, will keep you compliant and guarantee to find you the best price. You’ll require our services if your business deals with incontinence waste, nappy waste, sanitary waste or even protective garments, dressings or application tools which may be contaminated by body fluids. It doesn’t matter if you produce a lot or a little, our flexible packages cater to you and include free legal paperwork, the right disposal containers and your first two weeks of servicing for free. Call us to learn more or to get an instant quote. We give you the bags you’ll need as standard, no extra charges! Offensive Waste (EWC 18-01-04) is defined in the Controlled Waste Regulations 2012 as being waste which is unpleasant and may cause offence to the senses. Offensive waste is non-infectious, but only a few specific waste types are suitable to be placed into an offensive waste sack without strict and carefully documented procedures being put in place beforehand. Protective garments and outer dressings that are not contaminated with bodily fluids. I.E: gloves, gowns and masks. Offensive waste is taken from your premises by a fully certified waste carrier and incinerated or sent to a non-hazardous landfill site. Our most popular bin is the 50 litre indoor bin, with the yellow tiger stripe bag. When these bags are full, they can be transferred to a specific and offensive waste specific wheelie bin outside your premises. This allows for us to empty the wheelie bin on a schedule, regardless of the amount of bags inside and works out to be the most cost effective way for you to manage your offensive waste, instead of a specific per bag rate. Since the Landfill Directive came into use, we have had to change the way we dispose of your hazardous waste in order to comply with all the correct laws and legislations. Every type of waste, including hazardous, has an EWC code, which is a unique identifier that enables us to see exactly what your waste is, and where it needs to go. 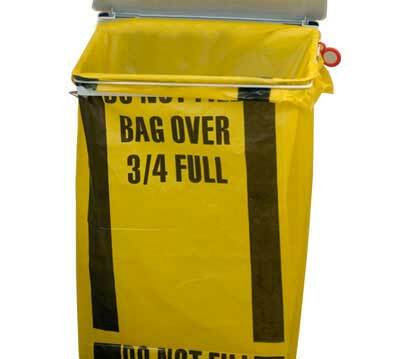 An EWC code is printed on all clinical buckets and bags, including your hazardous waste container. For additional EWC Code information, please see the .GOV website. As a producer of waste, you are obliged to ensure the safe housing, removal and disposal of your waste. The only way to do this is to use a reputable waste collection company, and posess duty of care certification. At Direct365, we give you all the paperwork you'll need, including duty of care certification so you can prove you've had your waste disposed of properly.